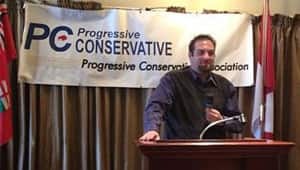 Newspaper Rock: Young conservative slams "freeloading Indians"
Manitoba PC youth party leader quits over racist commentsManitoba's Progressive Conservative Party has ousted its youth party president over derogatory comments he made on Facebook about aboriginal people. Braydon Mazurkiewich, the president of the party's youth wing, was asked to resign on Friday after he posted the comment, in which he was reacting to a Federal Court ruling on the sale of the former Kapyong Barracks site in Winnipeg. "The comments Braydon made are isolated, they are terribly inappropriate, and they're detrimental to the party. And so with all that, we just can't accept it," party president Ryan Matthews told CBC News on Friday. Matthews said he asked Mazurkiewich for his resignation and received it. First Nations leaders have been celebrating the Federal Court decision, which ruled that Ottawa failed to four First Nations, or even communicate properly with them, on the sale of the former Canadian Forces base. "Listen carefully to the news today. Looks like they might be announcing that they're building a freaking reserve in the middle of Winnipeg. This city is quickly becoming the laughing stock of the entire country," Mazurkiewich wrote on his Facebook page. After some people commented on his post, Mazurkiewich then wrote, "That was built for hardworking men and women of the military, not freeloading Indians." Mazurkiewich told CBC News he feels terrible about the Facebook post, and he's sorry if his comments offended anyone. At the same time, he said he does have strong feelings about aboriginal people. "I do know hard-working aboriginal people, and I commend them for the work they do and the taxes that they pay. But a lot of them don't," he said. "I do know that they live pretty much tax-free, and it pains me to see that I work very hard and I pay so much in taxes…. One day I want to move out of my parents' place buy a house and start a family. I want to live the Canadian dream." Comment: To point out the obvious, Natives have served in military in great numbers. They're part of Canada and its military, not something else. And Canadians built the military base, as they "built" the whole country, by taking land that didn't belong to them. That's the basic issue here, not the sanctity of one base. For more on Indians as welfare recipients, see Indian Programs = "Welfare"? and Mine CEO: Natives Have "Hand Out." Those were the words Opposition Leader Brian Pallister used Thursday to describe racist comments made last week by the former president of his political party's youth wing. "I've spent a long time in my life advocating and fighting for aboriginal rights and for aboriginal people," Pallister said. "So has the Progressive Conservative Party of Manitoba. "To believe that we're going to get anywhere as a province if we don't stand shoulder to shoulder with one another is a mistake." Pallister's comments came as several members of the aboriginal community considered asking Winnipeg police to investigate Braydon Mazurkiewich for allegedly committing a hate crime, a spokeswoman for the Assembly of Manitoba Chiefs said.